Chuck is back! And not just the show but the character too. Let me clarify that. Chuck the show is back after a 7 week holiday hiatus. Chuck the character is starting to show some light again from under the bushel this season arc has put him under. It is a welcome start and the bushel should be removed completely by the time the 4.13 showdown confrontation with Volkoff rolls around. Between Chuck reverting to a child state every time his mother showed up to being hamstrung by the loss of the Intersect to struggling to balance his spy life with his personal life; Chuck has been in react mode for the vast majority of this season. He has been a fire fighting pawn. Chuck has been given little to no opportunity to display those qualities that won Sarah and audiences alike over. This has been a fantastic season for Sarah Walker growth, Morgan Grimes growth, and even some small scraps of Casey growth. But for Chuck it has been a tough haul. And the big reason for me why Season 4 has been an underwhelming experience from the big picture view. It is a debilitating problem for a show when your titular character is not being used to his best or fullest capabilities. The old writing dilemma of telling a story honestly is a constant battle between plot and character. With good writing the plot unfolds based on the character’s established traits. Weaker writing bends the character to fulfil story requirements. Good writing takes time. In television time is a precious commodity. The writing for Chuck the character has taken the plot driver road. For me it is quite obvious that Chuck has been subjugated to serve the story points so far this season. With the end game in sight the need for the heroic Chuck has re-surfaced. Before the break, Chuck had reacquired the Intersect as a prelude to making the climatic charge that will happen in 4.12 and 4.13. We saw Chuck in the Balcony able to properly prioritize mission versus personal priorities for the first time in a long while. Praise the stars! While he desperately wants to make the perfect proposal to Sarah, Chuck does not let that, or Morgan, sway him from a proper course. A more than welcome return to form by someone who admits that he is not a great multi-tasker. It was also a welcome sight to see Chuck taking charge from time to time in the spy world. For the first time in a while Zac Levi looked like he was having fun playing Chuck! Proposing to someone as special as a Sarah Walker is a daunting task indeed, so any skittishness Chuck relayed in the personal moments is understandable. He knows he is no James Bond, or Bryce Larkin, or Cole Barker, or a Daniel Shaw. Okay, okay. Chuck definitely trumps a Daniel Shaw any day! Actually Chuck trumps them all. Just ask Sarah Walker. Chuck learns via Casey that there are no perfect moments. All you need is your girl and the intestinal fortitude to ask THE QUESTION. And that is all the matters. Morgan makes sure Chuck mints in both pockets. Q eat your heart out! ‘Casey is your man-servant. Let him man serve you.’ ‘Oh Jon, Jon! Villain Pierre licks hypo and gives Chuck writer Lauren Lefranc a shout out identifying that the chip is in a bottle of ’86 Chateau Lefranc. Nod to Danny Kaye’s Court Jester- ‘ A peppery pino with a stable on the label and a stork on the cork. Sarah plays flirty drunk to disarm some baddies. Chuck flashes and fights with wine glass in hand. Casey still spot on in the spy world intuiting Beckman has switched the chip. Lester is a lucky little Canadian. Castle engineers should be complimented on making the spy facility acoustically accessible for eavesdropping – Sarah finds out about the proposal sub-mission. Sarah takes over proposal mission and Morgan Grimes becomes double agent! Sarah wanting the proposal to happen for Chuck…. and for her. Sarah’s, and Chuck’s intuition about something with the exchange mission being off, prove to be true. Full Moon Proposal sub mission. Morgan working the dual headsets! Woot! Morgan covers all sub-mission contingencies. He equips Chuck with Tide-To-Go tubes. Casey steps in to help Full Moon Proposal sub-mission. Morgan calming Sarah by giving his blessing to marry Chuck. Sweet moment. Casey catches dropped ring. Sarah retrieves ring and preserves Chuck’s illusion of being in control of the proposal. Now that’s true teamwork! Chuck telling Sarah that being with her anywhere is the most beautiful place in the world. Casey mentions Alex’s mom and his girl Kathleen! Huzzah! Sarah’s tearful promise to bring MamaB back to Chuck. “Chuck vs. the Balcony” started out with a seemingly generic mission that adroitly morphed into the launch pad for the next two episodes that will deal with taking down Volkoff. Seizing on an opportunity inspired by Sarah’s request that some initiative be formed to take down Volkoff and rescue MamaB, General Beckman quickly manufactured that opportunity. So quickly that Sarah never had the chance to explain it to Chuck. Using the followup buy to cast Sarah in the role of double agent, Beckman has given Sarah the means of getting into Volkoff’s organization. Sarah’s innately strong protective drive was also used effectively as the catalyst for her request to Beckman during the opening restaurant scene when Chuck lamented his lack of attention to Sarah because of the Volkoff situation. During the same scene Chuck’s proposal plans were humorously scuttled as an oblivious Sarah recounted the horror of her parent’s proposal. This episode made excellent use of the main cast with Morgan’s behind the scenes proposal submission activities providing some very funny counterpoints to the main missions. Sarah’s discovery and commandeering of the proposal, making Morgan a double agent in the process was well played being touching and funny at the same time. By the time Casey swooped in to help, the show was using the main cast members to their best abilities. It was great to see Chuck’s friends working in unison to maintain the illusion that he was in control of the situation. 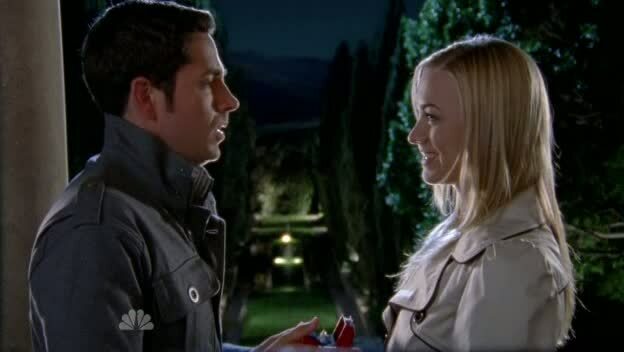 Right down to Sarah scooping up the dropped engagement ring and putting it back in Chuck’s pocket. The villains were forgettable this week but with the focus on the relationships between the main cast members this is an understandable non-issue. The BuyMore plot was more palatable to me this time because of the Canadian basis but the Jeffster Whitesnake performance of, ‘Is This Love?’ fell flat. Non-Canadians were doubtless not nearly so enthralled. I cannot help but wonder each time how the episode would have played out if there had been some Ellie/Devon and/or Alex subplot to support the main storyline instead. A wonderfully, entertaining return episode for Chuck with some snappy one liners, many in jokes, and the inevitable clash between professional and personal lives for Chuck and Sarah. Chuck works best as a show when the missions are plausible and any implausibilities are kept to the humorous aspects of the relationships between the characters. “Chuck vs. the Balcony” was such an episode.